Pro-Line Ambush 4x4 1/25 RTR Micro Rock Crawler EP w/ 2.4GHz Radio, Battery, Charger #4004-00. Are you ready for Big Adventure in Small Scale? The Pro-Line Ambush 4x4 1/25 Scale RTR Electric Mini Scale Crawler is designed to bring Scale Adventure to your living room, desk, backyard, or anywhere your imagination takes you! At quick glance, the Ambush features full-time 4 wheel drive with solid axles and true leaf spring suspension, an included 2.4GHz transmitter with an on-the-fly speed selector so you can go slow or fast, an included 7.4V hard case Lithium-Ion 350mAh battery pack, and an included USB battery charger. Ladder Frame Chassis: The Ambush Mini Crawler comes stock with a 3mm thick Steel Ladder Frame that forms a Solid Base for the Transmission and Suspension. The Steel Frame Plates are Black Oxide Coated for long lasting protection against the elements. The Frame is capped off on each end with sleek plastic chassis mounted bumpers that protect the body without getting in the way of obstacles on the trail. Leaf Spring Suspension: Similar to many full-size Crawlers, the Ambush Mini Crawler has a Steel Leaf Spring Suspension connected to Front and Rear Solid Axles. Each corner has a 3-Leaf pack with working shackles and attaches to plastic friction shocks that limit down travel. The Scale Solid Axles provide Full-Time 4wd for maximum Traction and Crawling Performance! Take Control: Control the Ambush Mini Crawler just like your high-end 1:10 Crawler with full proportional control from the included 2.4GHz Transmitter and mini-electronics. The Micro Torque brushed Motor provides all the power you need to Conquer the Terrain and the G9000 Micro Servo gives you plenty of steering power. The integrated ESC/Receiver includes an open 3rd Channel Port allowing for unique customization or future 3rd Channel Option Parts! Body and Interior: The Ambush Mini Crawler is topped off with the Open Roll Cage Ambush Trail Rig Body that takes inspiration from one of Pro-Line? S first Rock Crawling Bodies ever made and includes a highly detailed Interior and Driver Figure for added Scale Realism. Pro-Line includes an optional Sticker Sheet in Orange or Green Color Scheme so you can Customize your Rig right out of the Box! Mini Flat Iron Tires & Denali Wheels: Pro-Line had to include the Best Performing and Best Looking Wheels and Tires with Ambush Mini Crawler; Genuine Pro-Line Mini Flat Iron Tires and Denali Wheels! Just like their bigger 1.9?? Siblings, the Mini Flat Iron Tires provide Incredible Traction on any terrain while maintaining a Scale Appearance. The Mini Denali Wheels are Black and include a Gray Plastic faux Bead-Loc for incredible Scale Detail. 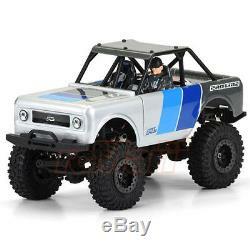 Pro-Line Ambush 4x4 1:25 Electric Mini Scale Crawler RTR. 2.4GHz Pistol Grip Transmitter. ESC / 2.4GHz Receiver Combo. Ambush body with Optional Orange and Green Color Decal Sheet (Blue graphics are applied). Mini Flat Iron Tires with Denali Wheels. The item "Pro-Line Ambush 4x4 125 RTR Micro Rock Crawler Radio Battery Charger #4004-00" is in sale since Tuesday, October 3, 2017. This item is in the category "Toys & Hobbies\Radio Control & Control Line\RC Model Vehicles & Kits\Cars, Trucks & Motorcycles". The seller is "rcmart" and is located in HK. This item can be shipped worldwide.